One tree, multiple branches: From publishing high-quality books to offering specialized workshops and writer’s resources, we strive to make the world a more interesting place, one story at a time. From childhood spy adventures to one-act plays featuring blackmailed siblings as cast members, Lisa McBride has been spinning tales and hunting for audiences since she was in third grade. With over 10 years of teaching experience, she’s taught writing courses and workshops in Kansas, Texas, and Alaska. She earned an MFA in creative writing from Texas State University. She’s currently at work on the first novel of a new urban fantasy series set among Kansas City’s haunted house row. 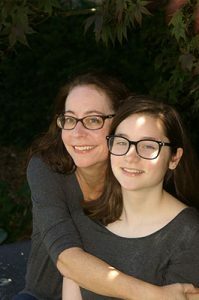 Lisa partnered with her 14-year-old daughter, Jordan, to write a children’s book, The Mad Adventures of Skeeter Walsh, which will be released in Fall 2018. Jordan’s love of drawing and painting may have wreaked paint-covered havoc on most of her wardrobe but has also produced the illustrations for The Mad Adventures of Skeeter Walsh. Her work has been displayed in local art shows, and she’s currently busy launching her own online shop.